This team has a tough act to follow based on the 17U program’s success but there is no doubt they can get it done, both now and down the road. On Saturday night, 6’3 sophomore Robert Eads of Orlando Edgewater was a fierce scorer. While he did connect on a couple of jumpers, Eads seemed all about challenging the defense to stop him from getting to and scoring at the basket. He was successful more times than not. He also proved to be quite the rebounder on the defensive end. Jordan Sears, a 5’9 sophomore at Port Orange Atlantic, shot the ball well on Saturday with a trio of makes from beyond the arc. He’s quite fast with the ball and does all he can to be disruptive when guarding the dribbler. The makeup of this team is one that suggest success this coming season in the EYBL. The bigs move well and can score, the wings are long, athletic, and get the ball in the basket in a variety of ways, and the players given responsibility to run the show can all make plays for others or themselves. Jamille Reynolds, a 6’9 forward from St. Pete Lakewood, has a real chance to make a national name for himself. He’s got size, moves well up and down the court, and has good scoring tools in the post. Zack Anderson, a 6’6 wing from Apopka, is the sleeper of the group. He’s long and can defend multiple positions. Offensively, he will make open jumpers but is better when the game is being played uptempo. A snafu delayed the team’s jerseys arriving in time for Saturday but the team should jell in time to make some noise later this month. The player making the biggest impression was 6’4 wing Keano Caulderon out of DME Academy in Daytona. His jump shot went down with regularity but he proved to be a high flyer in transition. This South Florida contingent should be very competitive on the Adidas Gauntlet circuit. It doesn’t have a player of great size (6’7 or bigger) but everyone seems to be able to dribble, pass, and shoot the basketball. Brandon Garcia (pictured), a 6’2 guard from Weston Cypress Bay, scored well from all three levels on Saturday. He’s athletic enough to help in the rebounding department and makes good decisions with the ball so he can play either guard spot. 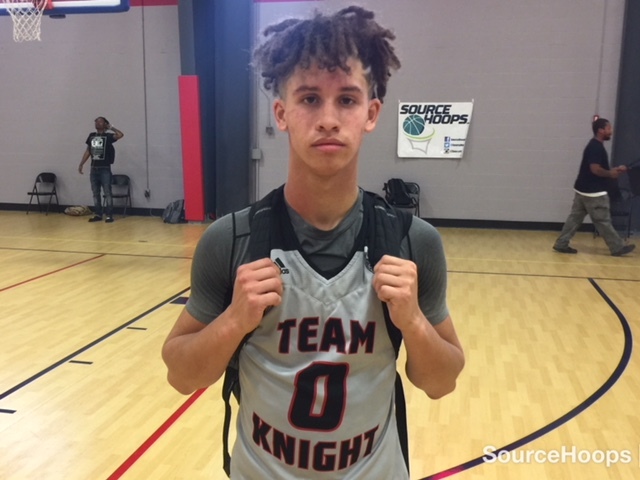 Frank Gilliam, a 5’10 guard out of St. Pete Gibbs, had a great high school season, scoring nearly 25 points a game but with this talented group he can be the kind of point guard that makes his teammates better. He’s tough to keep out of the lane and more often than not finds the right guy to take the shot. We liked the way this group played with tenacity. The pieces are still in the process of coming together but given time, this group should make their mark in this age group. Armani Thomas, a 6’4 sophomore from Kissimmee Osceola, had a lot of success getting to the basket and finishing in traffic. He had more than his fair share of “and one” plays. Eric Canavan, a 6’6 sophomore from Windemere, was all over the glass at both ends, scoring well against more athletic players. He spent a lot of time on the floor going after loose balls and a lot of time at the foul line after beating the defense down court. The group out of Jacksonville had a tough Saturday as they arrived late for their first game due to traffic issues and then only had six available players. Still with all that adversity, they didn’t quit when down big in the final contest of Saturday night. Tyree Sanders, a 6’2 guard out Jacksonville First Coast, was dialed in from deep, connecting on five threes. Also a football player, he’s physically strong and a good athlete. Very similar to Sanders in both size and style was Oliver Osier, a 6’2 wing out of Middleburg. He too proved to be a deadly shooter from beyond the arc as well as an athlete that runs the floor and finish in transition.